Since last October’s Mennonite Church Canada Assembly, more than 12 new congregations have contacted the Winnipeg office requesting information on how to develop an international Witness relationship! We give thanks for these interested congregations and for the many others who might be considering developing a more global connection through our Witness workers. If your congregation is interested in learning more about a Witness partnership and developing that international connection, please contact your Regional Church office. Busy wrapping up activities and preparing for their transition to life in Canada, moving to Lethbridge, Alberta, Greg Rabus & Jennifer Otto expressed recently great appreciation for the care and support of Lethbridge Mennonite Church. Members from the congregation have already contacted Greg and Jennifer with offers to help. One couple in particular, Kevin & Noreen Neufeld actually came to visit the Otto/Rabus family in Ludwigshafen while traveling in Germany to visit their son and partner, “which was really nice” said Greg. We give thanks for the wonderful care demonstrated by members of Lethbridge Mennonite Church towards the Otto/Rabus family as they make the significant transition this summer from Germany to Canada. 1) Prayer for his safe itinerary travel in each city and to develop good relationships with people. 2) For Sook Kyoung (his wife) as she provides good care for children in her classes. Sook Kyoung is also having a good time with Daniel (their son) while he visits South Korea until end of August. 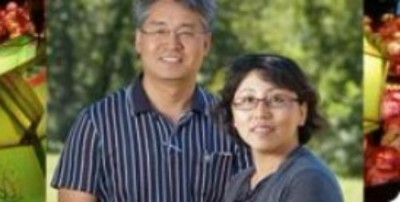 Tom & Christine Poovong’s prayer request is that the Lord will continue to use them to be a blessing to: their home church, their partner churches, to the wider Mennonite church to their families and friends. As we're doing the Lord's work in His field and teach other people about our Anabaptist/Mennonite faith, we pray that many people will become Jesus’ disciples living and walking with him every day. Our prayer is that for the next three years we will have one thousand disciples in Thailand and Laos. Tom relates the following story: “Just a few weeks ago I was at the photo shop to take my passport photo the owner asked me where I am going. When I told her I am a Mennonite Christian she was surprised and told me that she never knew any Asian Mennonites. So I had a chance to tell her my great story about our Anabaptist/Mennonite history including my own - how I became a Mennonite Christian. I believed we need to tell people more about our Mennonite faith including Asian Mennonite.” Thank you Tom and Christine for reminding us that we all have a great story to tell!